There is no better time than the present to #BeTheSohrs. From flooding in Houston to hurricanes in the Atlantic and Caribbean, and earthquakes in Mexico. There is no better time than now to show the love of Jesus. We have an opportunity like no other to demonstrate what we, Christians, do. Let’s spread the love of Jesus in any way we can. 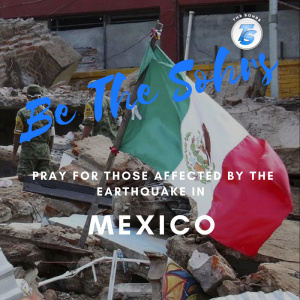 This week’s #BeTheSohrs focus is, do something, anything, for those affected by the earthquake in Mexico. For some that means send monetary gifts, for others that means be the actual hands and feet and then for others, stand in the gap with prayer for those impacted. It’s time, our time to #BeTheSohrs!